Through the years we have been the honored recipients of numerous awards given by our local Ohio and Michigan Home Builders Associations, industry groups, area consumers, and our clients. Best Interior Merchandising Over 4,000 sq. ft.
One of our most treasured awards is the People's Choice Award. 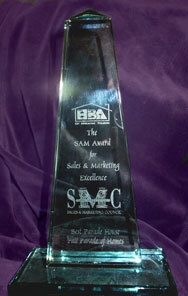 It's awarded by area consumers who vote on a home's curb appeal, design, floor plan, and overall construction quality. Macek Custom Builders is proud to have achieved the highest rating possible for energy efficient homes that it has built. The Energy Star Home Rating System is a measure of a home's energy efficiency, developed by the Federal government. An independent rater tests the house for various factors such as levels of insulation, efficiency of windows, type and efficiency of heating-cooling equipment and assigns a score ranging from 1 to 100 points. The points are then translated to the following scale; 1 Star = poor, 2 Star = fair, 3 Star = average, 4 Star = good, 5 Star = best, very efficient . This information can then be used to determine annual energy costs and in mortgage finance considerations.